A Scout Postal Service starts operating in the City Centre and spreads to other districts. Forty mail boxes marked with the Polish eagle and Scout emblem are installed around the town. Mail boxes are emptied twice a day (at 9:00 a.m. and 4:00 p.m.) with same day delivery for 'local' mail and 2-3 days for 'long-distance' (between districts) mail. All correspondence is censored and limited to 25 words. Daily letter volume ranges from 3,000 to 6,000 pieces; it peaked at 10,000 on August 13. 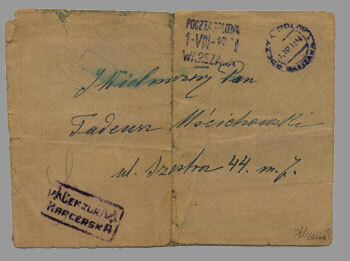 Mail is delivered by 10- to 15-year old scouts of the Grey Ranks – the wartime name of Polish Scouting. All mail is postmarked and, after the beginning of September, stamped. The service is eventually incorporated into the Home Army and renamed the Army Postal Service. It operated until October 3, 1944. During the Uprising, 116,317 pieces of mail were delivered.